Size (Length x Width): Required Choose Options 1 x 3/4" 1" x 1" 1 1/2" x 3/4" 1 1/2" x 1" 1 1/2" x 1 1/2" 2" x 3/4" 2" x 1" 2" x 1 1/2" 2" x 2" 2 1/2" x 3/4" 2 1/2" x 1" 2 1/2" x 1 1/2" 2 1/2" x 2" 2 1/2" x 2 1/2" 3" x 3/4" 3" x 1" 3" x 1 1/2" 3" x 2" 3" x 2 1/2" 3" x 3" 3 1/2" x 3/4" 3 1/2" x 1" 3 1/2" x 1 1/2" 3 1/2" x 2" 3 1/2" x 2 1/2" 3 1/2" x 3" 3 1/2" x 3 1/2" 4" x 3/4" 4" x 1" 4" x 1 1/2" 4" x 2" 4" x 2 1/2" 4" x 3" 4" x 3 1/2" 4" x 4" 5" x 1 1/2" 5" x 2" 5" x 2 1/2" 5" x 3" 5" x 3 1/2" 5" x 4" 5" x 4 1/2" 5" x 5" 6" x 1 1/2" 6" x 2" 6" x 2 1/2" 6" x 3" 6" x 3 1/2" 6" x 4" 6" x 4 1/2" 6" x 5" 6" x 5 1/2" 6" x 6" 7" x 2" 7" x 2 1/2" 7" x 3" 7" x 3 1/2" 7" x 4" 7" x 4 1/2" 7" x 5" 7" x 5 1/2" 7" x 6" 7" x 6 1/2" 7" x 7" 8" x 2" 8" x 2 1/2" 8" x 3" 8" x 3 1/2" 8" x 4" 8" x 4 1/2" 8" x 5" 8" x 5 1/2" 8" x 6" 8" x 6 1/2" 8" x 7" 8" x 7 1/2" 8" x 8" 9" x 2" 9" x 3" 9" x 4" 9" x 5" 9" x 6" 9" x 7" 9" x 8" 9" x 9" 10" x 2" 10" x 3" 10" x 4" 10" x 5" 10" x 6" 10" x 7" 10" x 8" 10" x 9" 10" x 10" 11" x 2" 11" x 3" 11" x 4" 11" x 5" 11" x 6" 11" x 7" 11" x 8" 11" x 9" 11" x 10" 11" x 11" 12" x 2" 12" x 3" 12" x 4" 12" x 5" 12" x 6" 12" x 7" 12" x 8" 12" x 9" 12" x 10" 12" x 11" 12" x 12"
These solid brass plates are designed for machine or hand engraving (even painting) and can be used for a variety of purposes from nameplates to desk or door plates to plaques and awards. Other uses are dog tags, jewelry, and artwork. The material is rigid but can be bent by force and pliable enough to bend slightly without distorting. These are made from high quality brass designed for engraving and will have a finish that uniform, smooth, and blemish-free. All of our engraving plates are guaranteed to be manufactured as the ‘best available’ in the industry and you will receive the highest quality that is proudly made in the USA. 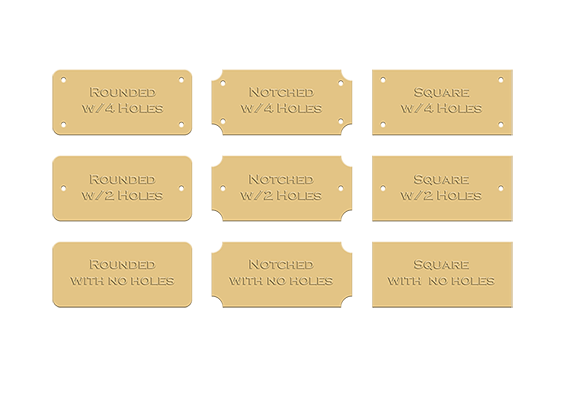 Material thickness; brass is .60mm / .023"
Custom sizes, holes, and corners or any other customization fall under our "Customization's Return Policy"
Our best selling engraving plates are Brass and Aluminum (Brushed are a bit more popular than and Bright) that are used on trophy's, plaques, awards, memorials, desk nameplates, and other engraving work. If you choose brushed brass or brushed aluminum, you will be using the most popular engraving plates. For coated engraving plates, our black aluminum and laser black aluminum (if your using a laser engraver) are the top choices for customers. The various aluminum colors can be used to match a background or picture and the anodized aluminum is designed for accessories or outdoor use. Both the colored aluminum and anodized aluminum are designed for scratch or rotary engraving. Solid metal brass and aluminum will maintain their color but painted or coated plates can wear off from physical wear and abrasion or when the plates are significantly bent, heated, or exposed to chemicals. The anodized metals are designed to withstand weather and wear and will maintain their surface even with outdoor exposure, sunlight, and moisture. Looking to use them for another purpose? The solid metal engraving plates can be heated, bent, or soldered (coated plates should NOT). Brass and aluminum without colors can be bent and modified (there can be some surface discoloring applying a torch and you may need to protect the metal when heating or possibly polish it after) because of surface treatments, you should do some testing before starting important projects. If you need help choosing plates, just contact us and we will try to provide some help in choosing the best plates for your needs. Round Brass Engraving Disc 1 1/2"
We back up our promises.